The Hip-Hop community has influenced dance culture consistently for over 30 years and some of the best moves have been gleaned from the Eighties and are still celebrated in competition today. If you see a dance battle, nine times out of ten, break dancing will be a part of the show. France puts on an annual dance battle called Chelles Battle Pro. 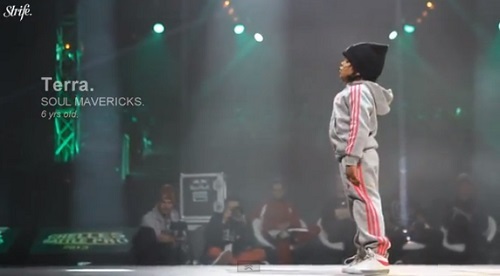 The competition took place Saturday and the baby with the most swag and skill of the B-Boy crew The Soul Mavericks, was the electrifying 6-year-old dance phenom, Terra. She broke it down with every difficult move from the hesistant crawl, to headstands with hops, and endless spins holding her leg, all with bold bravado that should’ve sent her opponent running off the stage with his tail between his legs. According to Digital Journal, she joined the all male dance crew last year along with her 8-year-old sister Eddie. Check her out for yourself. You won’t believe her explosive character and moves. You will be shocked that she didn’t win the competition.